Sleeping disorders in adults isn’t an alien concept, but have you ever heard of sleeping disorders in children? Did your child wake up from sleep either yelling or crying and you weren’t sure of what caused the same? Child sleeping disorders is a growing concern for parents these days. Some of the most common sleeping disorders observed in children include sleepwalking, night terrors, sleep-talking, and nightmares. What are nightmares in children? Nightmares in children form a category of sleep disorders that are defined as recurrent episodes of awakening from sleep due to the recall of some intensely disturbing dream sequence. Such dreams generally involve incidences of fear, anxiety, anger, disgust, sadness, and other such emotions. However, child nightmares are temporary and developmentally normal for most children. The Diagnostic and Statistical Manual of Mental Disorders, Fifth Edition (DSM-5) defines nightmares as “repeated awakenings with recollection of terrifying dreams, usually involving threats to survival, safety or physical integrity”. 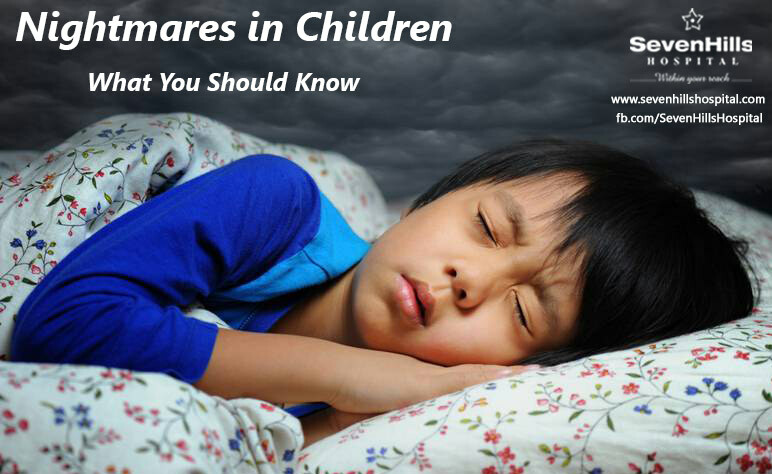 How to know if your child has had a nightmare? If your child wakes up fearful or crying and finds it difficult to fall asleep again, chances are that they have had a nightmare. Nightmares in children are usually caused by sleep deprivation, and shouldn’t be confused with night terrors, which is a less common sleeping disorder. Nightmares usually happen in the second half of the night when your child’s dreaming is most likely to occur, and most of the times, your child might wake up from sleep and remember these scary incidents well enough. Night terrors, on the other hand, strike during the first third of the night and children are suddenly awakened from deep sleep and often do not remember these incidents in the morning. What causes nightmares in children? Experimenting with tricks like these might bring your child back in to the reality and they might be able to overcome these nightmares with greater ease. In either case, ensure that there’s nothing that’s emotionally disturbing your child, since repeated episodes of nightmares in children may interrupt with the proper functioning of their mind and body. In cases of extreme/severe episodes of nightmares, it is suggested that you consult a doctor for the same.